Macaroni is a hollow pasta that is made from durum wheat, it comes in a variety of sizes and lengths. The hollow shape of macaroni makes it ideal for serving with heavy sauces, and it can be added to casseroles too. Melt the butter in saucepan and gradually add the flour to the butter and whisk well to blend. Stir in milk a little at a time, whisking constantly until smooth. Allow to cook over medium-low heat until sauce simmers and thickens to desired consistency. In the meantime, cook the macaroni as per pack instructions, drain and place in a buttered casserole dish. 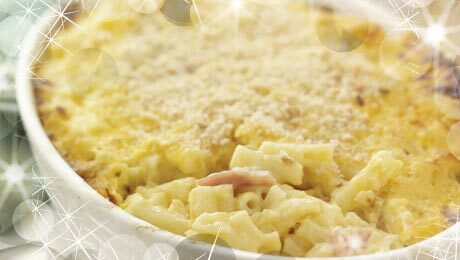 Blend the ham, onion and cheese with the white sauce and pour over the cooked macaroni. Bake uncovered in preheated oven for 30-35 minutes.